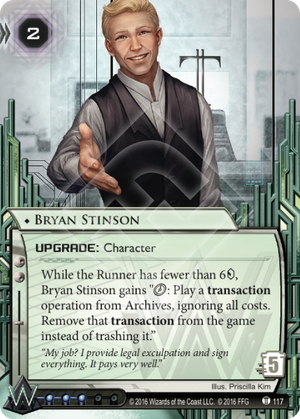 While the Runner has fewer than 6credit, Bryan Stinson gains "click: Play a transaction operation from Archives, ignoring all costs. Remove that transaction from the game instead of trashing it." "My job? I provide legal exculpation and sign everything. It pays very well." If the Corp plays Paywall Implementation with Bryan Stinson, does it get removed from the game? If so, when? What if the Runner trashes Bryan Stinson before an agenda is stolen or another current is played? Paywall Implementation will be removed from the game instead of trashed whenever it would normally get trashed: once an agenda is stolen or another current is played. Once Bryan Stinson’s ability is triggered, it exists independently of Bryan Stinson, so Paywall Implementation will still be removed from game instead of being trashed even if Bryan Stinson is trashed before that happens. If the Corp plays a terminal transaction with Bryan Stinson, such as Violet Level Clearance, does it still get removed from the game? Yes. “After you resolve this operation” does not meet its trigger condition until the operation is trashed following its resolution, so the operation resolves, is removed from the game instead of being trashed, and then the game immediately advances to discard phase. Don't let that 'T' in the background fool you--Bryan has his offices at Titan, but he's a GRNDL man through and through. Yes, there's a lot of fancy tricks involving various cards with 'Account' in their name, or you can try taxing out the runner and hoping you can get them below 6 credits so that Bryan can work his magic. But that eats deck space, and more importantly takes time. But you get one turn in every game where Bryan Stinson is 100% guaranteed to be able to work his financial magic--your very first turn of the game. You can play a transaction, play Bryan, and then replay your transaction, and say go. It stands to reason, then, that you want to make that turn as big as possible. Enter GRNDL. While most corps have to settle for Hedge Fund, bringing them up to a 'mere' 17 credits (or 19 in the case of Building a Better World), GRNDL starts with enough credits to immediately Restructure, which becomes truly absurd with Bryan Stinson, catapulting you to 28 credits on turn one. That is a LUDICROUS pile of money that that the runner cannot hope to match--even the powerful Temüjin Contract is only going to get them to 21, and that's if they do nothing but install it and run. The best the runner can do is double Account Siphon, in which case they have made a conscious decision to float tags against GRNDL, and what happens next is just going to improve the average IQ of New Angeles residents. Now that you are filthy stinkin' rich, the runner is trapped, even though you have no board to speak of, because the spectre of being Midseasoned for roughly infinity looms large over them. You can install a naked agenda, turn it face up to show the runner that this is indeed an agenda and not a trap, double advance it and ship turn, and the runner will have no choice but to let you score it (which, this being GRNDL, is probably just going to result in you getting even richer). They can run Stinson, but unless they're Whizzard, trashing him is just going to put them even further behind economically, and you'll be able to comfortably maintain your lead the old-fashioned way. And if they try to build up their rig, they either have to stay above 5 credits and watch you score out as they set up, or they can concede that your bank account statement is just going to read"Yes", and that they will be nailed the instant they steal points. This plan isn't foolproof--it requires you to have Stinson and a good transaction in your opener, Film Critic continues to exist, and if the deck stacks against you and you don't see your kill cards. But that's all going to feel very distant indeed when you're busy buying the entire Cayman Islands. This card really intrigues me. I can't quite put my finger on it, but there's something about it that has me eagerly trying to make a deck with it. It further extends one of my favorite subtypes, the "Transaction" subtype, quite profoundly too. It has a slim window where it's ability can be used, but if you can use it, it's by far the best econ card in the game. On top of it costing 5 to trash and it being an upgrade, it's fantastic on paper. The obvious synergies are with Closed Accounts and Reversed Accounts. There are other ways to make the runner lose credits, such as ice subroutines and overall just taxing the runner with heavy ice or forcing them to trash Mumbad Virtual Tour, but they aren't reliable and they can easily be played around. In a meta dominated by Şifr and Parasite, relying on ice to help you with a particular strategy is not something you want to do. You can always keep this card unrezzed and rez it when you want to use it. The runner most likely thinks you're not using this card. But with Hard-Hitting News being so popular, the runner is almost always above 8 credits. So this 'surprise' factory isn't reliable either. Closed Accounts is the best credit denial card the corp has, but to get full use out of it WITH Bryan Stinson you need to use it as your first action so you can use as many transaction operations as possible before the runner gets 6 credits again, so that requires the runner float tags or somehow get tags on their last action, which is something that's not really done as running on their last action is dumb and there are increasingly better ways to deal with tags immediately, such as Aaron Marrón, and the overall amount of credits the runner has also makes tagging difficult. Tagging in Weiland is also challenging in itself to say the least. You can splash Hard-Hitting News and hope they can't remove all the tags, or splash the very expensive Midseason Replacements and hope you have the econ advantage to take full use of it. But if you're trying to make use of Bryan Stinson, you probably won't have the econ advantage. You can also use Bryan Stinson in NBN, but influence is rough, because you will probably want to use NBN: Controlling the Message to combat Parasite and Şifr. This means you will struggle to find influence to play the more important Weiland cards such as Scorched Earth and BOOM!, consdering Breaking News and SanSan City Grid are on the MWL. Reversed Accounts is far easier in Weiland but more of a tempo hit and can easily fail. Weiland isn't known for their traps, so if the runner sees a card with advancement tokens on it they will probably have no fear running to access/trash it. If they do trash this card with advancement tokens on it, then that is probably an entire turn you just wasted.. which is not good to say the least. If the runner is also filthy rich, Reversed Accounts becomes increasingly bad in conjunction with Bryan Stinson. And the runner probably is rich, because of Şifr and Parasite, taxing ice means nothing. Overall, this card is very interesting and when it's conditions are met it is the best econ card in the game. It's fun and extremely satisfying when you do pull it off, and of course very powerful. However, Bryan Stinson requires a fair amount of cards in conjunction with it to really make use of it, cards you might not otherwise use. So you're using a lot of your deck space for a wombo-combo that might or might not work. There are too many essential corp cards you would be missing out on if you use this combo. Not to mention, Weiland is also very weak at the moment. I think as the game goes on, this card can only get better. Not really relevant to the to card's function, but it's an expy of HIMYM's Barney Stinson. The quote is literally what he says in Season 9x15, UNPAUSE. This card has an awful lot of things going for it. It's an upgrade, so you don't need a special server protecting it. Just have him hang out in HQ or R&D or wherever. He costs 5 to trash, so you can sort of just leave him around until the runner drops below 6. While he's active, he's insane. Removing the costs kicks the efficiency of most things into superland. to gain 15 from a Restructure? Yes please! Even the humble Hedge Fund is a click for 9. You don't even have to have him out - if you see the runner get low on credits, you can just install him, rez, and click twice. The part where you can ignore the costs also includes the extra clicks for Double operations. He's a transparent reference to Neil Patrick Harris's character on How I Met Your Mother. I don't know yet what decks will end up running this yet - 3 influence is a lot to splash into other factions, and Weyland's decks are in a bit of a state of flux, as of this writing. (End of Flashpoint cycle.) There are a lot of neat toys on the horizon for Weyland though, between Terminal Directive and the upcoming Red Sand cycle. So if any Weyland decks take shape that can leverage unreasonable amounts of money, I fully expect Bryan to be part of that.